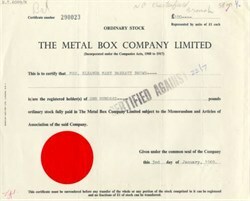 Beautifully engraved certificate from the Metal Box Company Limited dated 1969-1980. This historic document has an ornate border around it with a pen cancellation through it. This item is over 21 years old.